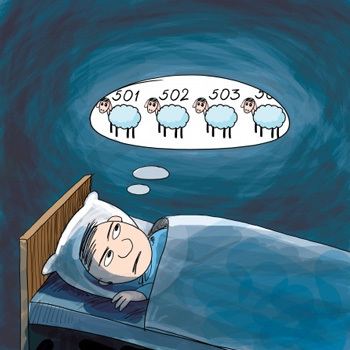 Insomnia is an unpleasant disorder, affecting work, relationships, and even health. It is also common; more than half of those questioned in a recent UK survey replied that they slept poorly and that this impacted on their day-to-day life. If insomnia meant nothing more than reduced concentration and an irritable mood, that would be bad enough. But the effects of chronic sleeplessness can be more insidious. A poor sleeper has a greater chance of suffering strokes, diabetes, and high blood pressure, and the impact on someone’s mental health cannot be overstated. Insomniacs often find themselves caught in a downward spiral. Worries begin, and that in turn causes problems at work as concentration falters, they snap at their spouse or children, forget to pay bills, and so on. These problems cause more stress and more insomnia. When faced with sleep problems, too many doctors send their patient away with a bottle of tablets. Britain’s National Health Service for example, spends more than £50 million a year on sleeping pills. But these medications do nothing to address the underlying cause, and there are side effects. Those who use sleeping pills or tranquilizers often experience a groggy “hangover” the next day, something just as unpleasant as the insomnia. First, you must understand why you cannot sleep. Unless you unearth the reason for your sleeplessness, you will never be rid of it. It may be obvious. Perhaps you have money worries or relationship problems. Others will need to dig deeper. Is it caused by underlying mental illness? Perhaps you live with chronic anxiety or depression. This can become like a background noise, something you have grown so used to, it exists unnoticed. Once the underlying cause is found, look at your pre-bedtime routine. Do you watch television or play computer games late at night? Such activities over-stimulate the mind. Switch off all screens at least an hour before going to bed. Read something light and cheerful instead, or do some meditation and yoga. Do not nap during the day. Exercise can be hugely beneficial. Go for a jog or long walk, but do it at least five hours before bedtime. For maximum effect, exercise outdoors, preferably in daylight. Exposure to natural light will boost melatonin levels. Next, take a look at your diet. Avoid caffeine after midday and don’t eat anything that might inflame the gut or nervous system, such as wheat and sugar. Some people switch to a raw-food diet. If this seems too extreme, at least cut down on junk food and fizzy drinks. Your emotional response to insomnia also plays a part, so be careful. Many people grow angry and stressed. They become infuriated with their body and feel it has let them down. Others sink into pessimism, expecting and almost willing themselves not to sleep. Sleep will come when you let go. The more you focus on your insomnia, the more likely you are to remain awake. Remember, sleep is not a lifestyle choice or a luxury; it is natural and necessary. So root out the underlying causes, stop watching TV before bed, meditate, change your diet, and take plenty of outdoor exercise. The body is not an enemy to be tricked. It wants to sleep. Trust your body. Follow the aforementioned advice, and eventually you will sleep.